New York: HarperCollins Publishers. First Edition. Hardcover. Fine/Fine w Dustjacket. 9.5" x 6.25. Signed by the author in Chinese and English on the title page. Seller: S. Bernstein & Co.
2011-02-07. New. Ships with Tracking Number! INTERNATIONAL WORLDWIDE Shipping available. Buy with confidence, excellent customer service! 2010-05-07. New. Ships with Tracking Number! INTERNATIONAL WORLDWIDE Shipping available. Buy with confidence, excellent customer service! 2011-02-02. Good. Ships with Tracking Number! INTERNATIONAL WORLDWIDE Shipping available. May not contain Access Codes or Supplements. May be ex-library. Shipping & Handling by region. Buy with confidence, excellent customer service! Canongate Books. PAPERBACK. 1847674372 New Condition. . New. Harper. Hardcover. 0061804096 New Condition. . New. 2011-02-07. Good. Ships with Tracking Number! INTERNATIONAL WORLDWIDE Shipping available. May not contain Access Codes or Supplements. May be ex-library. Shipping & Handling by region. Buy with confidence, excellent customer service! 2010-05-07. Good. Ships with Tracking Number! INTERNATIONAL WORLDWIDE Shipping available. May not contain Access Codes or Supplements. May be ex-library. Shipping & Handling by region. Buy with confidence, excellent customer service! Harper. Hardcover. 0061804096 New Condition *** Right Off the Shelf | Ships within 2 Business Days ~~~ Customer Service Is Our Top Priority! - Thank you for LOOKING :-) . New. Harper Perennial, 2011. Paperback. New. 8 x 5.31 cm. Canongate Books. PAPERBACK. 1847674372 Like New Condition. . Fine. Harper. Hardcover. 0061804096 Like New Condition. . Fine. Harper. Used - Good. Ships from the UK. Shows some signs of wear, and may have some markings on the inside. 100% Money Back Guarantee. Your purchase also supports literacy charities. Harper. Hardcover. 0061804096 . New. Harper Perennial, 2011-02-08. Paperback. Good. Canongate Books. PAPERBACK. 1847674372 Brand New ,Original Book , Direct from Source , Express 5-8 Business days worldwide Delivery. . New. Harper Perennial. PAPERBACK. 006180410X Special order direct from the distributor . New. Harper Perennial, 2011-02-08. Paperback. Used:Good. Country Driving: Three Journeys Across a Changing China. Melbourne: Text Publishing, 2010. Paperback octavo, very good condition, pages faintly toned, crease fore-edge rear cover, minor edgewear corners. 438 pp. The author traveled through China over the past decade - from the fortified towns along the Great Wall in the north, to once-remote villages now undergoing massive change, and finally to the entrepreneurial cities of the south-east, where factory start-ups are a dime a dozen. China is modernising quickly, and the author is caught up in that modernisation. Told with eloquence and wit, showing a China rarely seen by outsiders. Harper Perennial. PAPERBACK. 006180410X Remainder mark . Fine. Harper Perennial, February 2011. Trade . 4 PB Extra Nice +5%. 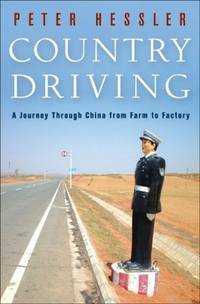 Country Driving: a Journey Through China from Farm to Factory. New York: Harper, 2010. 438pp. Light wear, DJ: wear extremities.. 1st. Hb. VG-/VG-. Harper Perennial, February 2011. Trade . 3 PB standard 50%. Harper, February 2010. Hardcover . 6.5 Bulk HB Low. UK: Canongate Books, 2011. Paperback. Very Good. 5.1 x 7.7 inches. Book Description After living in China for five years, and learning the language, Peter Hessler decided to undertake an even more complicated endeavor: he acquired his Chinese driving licence. An eye-opening challenge, it enabled him to embark on an epic journey driving across this most enigmatic of countries. Over seven years, he travelled to places rarely explored by tourists, into the factories exporting their goods to the world and into the homes of their workers. Full of extraordinary encounters and details of life beyond Beijing, it is an unforgettable, unique portrait of the country that will likely shape all our lives in the century to come. Harper Perennial, 2011. Book. Good. Soft cover. trade paperback, good reading copy. Harper Perennial. PAPERBACK. 006180410X *LIKE NEW* Ships Same Day or Next! . Fine. Harper Perennial. PAPERBACK. 006180410X *BRAND NEW* Ships Same Day or Next! . New. Harper Collins, 2010. First Edition . Hardcover. Fine/About Fine. 8vo - over 7¾ - 9¾" tall. First Edition, Third Printing. Hard cover 8vo - over 7¾ - 9¾" Tall. Fine book in About Fine unclipped DJ w/light wrinkle at top edge, now in clear cover. Travel through modern-day China. 438pp inc. Sources. Harper Perennial. PAPERBACK. 006180410X BRAND NEW, GIFT QUALITY! NOT OVERSTOCKS OR MARKED UP REMAINDERS! DIRECT FROM THE PUBLISHER!|0.73 . New. Canongate Books, 2011-04-01. Paperback. Good. Harper, 2010. light wear o/w very clean book--------------a journey through China from farm to factory. Hard Cover. Very Good/Very Good. 8vo - over 7¾" - 9¾" tall.